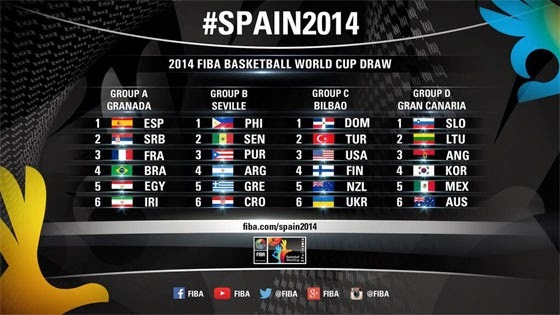 Gilas Pilipinas in Group B | 2014 FIBA World Cup Draw Results - Balita Boss! FIBA held the draw for the 2014 FIBA World Cup on Monday, February 3 at the Palau de la Musica Catalana in Barcelona, Spain. The Gilas Pilipinas or the Philippine National Men’s Basketball Team was drawn into Group B with the Senegal, Puerto Rico, Argentina, Greece and Croatia. Group A, considered as a toughest group, are composed of host country Spain, Serbia, European champion France, Brazil, Egypt and Iran. The USA will play Turkey in the group stage in a rematch of 2010 FIBA World Championship. USA beat Turkey 81-64 in the final and won the gold. The other teams drawn into Group C were the Dominican Republic, Finland, New Zealand and Ukraine. Group D are composed of Slovenia, Lithuania, African champion Angola, Korea, FIBA American champion Mexico and Australia. The preliminary round will take place from August 30 – September 4 in four cities. Group A is set to play in Granada, Group B will play in Seville, Group C will play in Bilbao and Group D will play in Gran Canaria. The top four teams in each group at the end of the preliminary round will advance to the round of 16 knockout games. The final round of 2014 FIBA World Cup will take place in Palau Sant Jordi in Barcelona and in the Palacio de los Deportes of Madrid from September 6-14.